Yes, I know it had been a while since I've posted. Bear with me folks, it was finals week at St. John's. All that matters is that I'm back, and so are the posts. Today I wanted to change up the pace, and feature an NFL team. In light of that, here on TFD, we have the Kansas City Chiefs. The Chiefs, who are in their 50th season of play, originated as one of the first AFL teams prior to the leagues merger with the NFL. Way back in 1960, the team that we now know as the Chiefs, started out as the Dallas Texans. The team relocated a short 3 seasons later to Missouri, where they are currently experiencing a renaissance of great play. Through their first 13 games, the team is 8-5, and currently in first place in the AFC west. They're looking to capture their first division title since 2003, and their first Championship since way back in 1969 in Superbowl 4. The acquisition of quarterback Matt Cassel from the New England Patriots a few seasons ago, has really set the tone for victory in Arrowhead Stadium. Arrowhead has been the Chiefs home since 1972, seats a crowd of over 81,000, and is considered to be the one of the greatest home field advantages in the NFL. The Cap featured above is a Reebok cap that I picked up in the Kansas City are a few years back, when I went to watch a Royals game next door. 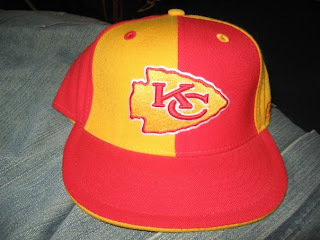 The cap has a pinwheeled red and yellow design for the crown with the Chiefs primary logo centered, and a red brim. Maybe the Chiefs can hold on to their winning ways for a few more weeks, and carry the momentum into the playoffs. The sea of red at Arrowhead Stadium had been waiting a long time for a resurgence like this, and with good reason. You can find all your Chiefs merch at the link below, which will take you to the team store. 6 weeks 'til the Superbowl in Dallas! Nice blog. I eally enjoyed knowing of your fitted stories. I love those Hat fitted.